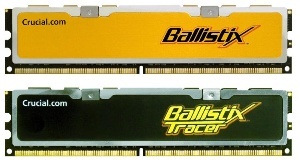 The new design is available on all DDR2 Ballistix and Ballistix Tracer memory modules Crucial Technology today unveiled a sleek new Crucial(R) Ballistix(R) and Ballistix Tracer(TM) memory module redesign. A perfect blend of style and substance, the new Crucial heat spreaders feature a diamond-cut silver edge pattern complementing the classic Ballistix and Ballistix Tracer gold and black color palette. Additionally, smaller clips provide an enhanced logo surface. "PC modders and gaming enthusiasts will be excited about our Crucial Ballistix and Ballistix Tracer module redesign," said Rus Miller, Crucial's Marketing Director. "The result of our efforts is a clean new look and feel that will look great in any PC, without sacrificing the performance end users have grown accustomed to receiving from Crucial."